Ladies, if you are pulling a hand full of hair out of the drain each morning and another from your hairbrush it might be time to rethink your shampoo. That hair is falling out of your head. You may be experiencing excessive hair loss if hair is falling out faster than it is growing back. Is your hair as thick as it used to be? If not, the hair that is growing back is thinner than the hair that fell out. They are supposed to be exactly the same size. Thin hair is a sign your hair follicles are not as healthy as they could be. Eventually, you will start to see bald spots! We all know what that looks like.The solution is not that bottle of shampoo you picked up at the Dollar store. In fact, the drying alcohol and chemicals included in some shampoos may be causing your hair loss. Using the best shampoo for hair growth consistently over time will give you the best chance of keeping your hair healthy. Once you experience hair loss and thinning, hair growth products may bring it back to its original beauty. They are not a one-time fix. Consistency is key. That is true of any health and beauty regimen. Faithfully using the products as part of your regular routine will give the best long-term results. We know women are busy and we are here to help. Standing before a stack of shelves loaded with hair shampoo products can cause your eyes to glaze over. Reading every label is impossible so we have done the research for you in order to help you select the best shampoo for hair growth. Rated highest in consumer satisfaction and formulated by using effective ingredients, these five products came out on top. Dihydrotestosterone (DHT) Blockers because DHT causes hair loss. DHT is a hormone found in higher levels in men but also plays an important role for women. DHT is synthesized in hair follicles, as well as adrenal glands, testes and prostate. Because of the metabolism of DHT, it plays a significant role in hair loss for both men and women. DHT prevents absorption of nutrition to hair follicles causing shorter growing periods and longer resting periods. The hair follicle begins to shrink and the hair becomes thinner and lighter until it becomes like peach fuzz. To prevent hair loss, especially in cases of male pattern baldness (which also affects women) DHT inhibitors approved by the FDA for treatment of hair loss are used. Dutasteride and Finasteride are the two most commonly used DHT inhibitors. They block DHT to the hair follicle enabling absorption of nutrients. The result is healthy hair growth, only achieved from healthy follicles. Biotin, a B vitamin combined with zinc is a proven solution to slow hair loss. Biotin is vitamin B7 and also known as Vitamin H. Zinc is a trace mineral essential for healthy body cells. B vitamins are necessary for healthy hair follicles, especially when combined with zinc. Supplementation with Biotin is desirable to reverse hair loss due to DHT because DHT causes a rapid loss of hair follicle cells. Biotin is recommended for strengthening hair and nails. It is found in many products for hair and skin because of the role it plays in healthy cells. B vitamins are essential for healthy cell growth throughout the body and healthy cell growth in hair follicles will insure hair grows thick and strong. If you are experiencing hair loss, it might be helpful to take an oral B complex with zinc as well as using hair care products that contain it. Pumpkin seed oil shown to slow or prevent hair loss by keeping the scalp healthy and supple. Pumpkin seed oil contains high levels of antioxidants, especially vitamin E, as well as fatty acids. Antioxidants neutralize free radicals that left unchecked can damage skin, including the scalp. Pumpkin seed oil is 50% oil and consists of four fatty acids: Palmitic acid regenerates natural oil so the scalp retains its protective barrier. Stearic acid is a lubricant that helps your scalp retain moisture. Linoleic acid prevents dry flaky scalp and oleic acids nourish and moisturize as well. A dry flaky scalp means skin irritations, infections and inflammation that prevents healthy hair growth. Together these fatty acids keep hair follicles healthy so hair is not thin and brittle causing breakage. Pumpkin seed oil improves the appearance of your hair by keeping it looking thick and shiny. For that reason it is an excellent addition to hair care products, particularly those used to promote hair growth. Niacin is another B vitamin, Vitamin B3 and it helps to nourish the scalp. Niacin has anti-inflammatory properties that lead to better blood circulation to your whole body including your scalp and hair follicle. In order to grow thick hair, hair follicles must to healthy and open so the hair shaft grows thick and strong. When the follicle and shaft are not healthy, thin and weak hair is the result. Hair breakage and premature fall-out caused by an unhealthy scalp will give the hair that does grow a weak and dull look. Thin hair is not thick enough to cover the scalp.as it should. You can see through the hair to the scalp giving the impression of balding. Adding Niacin to hair care products enhances the look and feel of hair. If hair is dry or damaged, adding niacin to the hair care formula will improve hair texture. Caffeine is effective to stimulate hair growth according to research published I n the International Journal of Dermatology. Hair exposed to caffeine showed improved growth after just eight days. The study even used hair exposed to DHT, a hair growth inhibitor, and even that study showed improved growth within the same eight days. Caffeine is absorbed through the pores of the skin, so instructions usually recommend the hair care product set on the scalp for two minutes for greatest benefits. If your hair falls out before it reaches shoulder length then the cells are remaining in the resting phase too long. Which is when hair sheds before it returns to the growth phase. When you are prone to hair shedding, does not have opportunity to grow long. Growth just stops and hair falls out. The stimulating properties of caffeine works on the cells to stimulate them and make the growing phase longer and the resting phase shorter. That gives the hair opportunity to grow longer. Natural oils and nutrients that promote healthy hair and scalp.are included in hair care products that promote hair growth. Natural oils like coconut, argan, emu and jojoba as well as others. These natural oils have nutrients that feed your scalp. They help get rid of dandruff, reduce dry and flaking scalp. The result is faster healthier hair growth. The oils and nutrients add volume to your hair as well because the hair itself is thicker, does not break and split and leaves a healthy shine. Pomegranate, avocado and rosemary oils are full of nutrients like vitamin B, A, D, E as well as iron and calcium. They help prevent thinning and brittle hair sometimes associated with ageing. The proteins repair damaged hair cuticles and prevent further damage from breaking and splitting. Some products may contain oils normally used for cooking, like olive oil, but that too is effective in hair care products. Ketoconazole is an antifungal medication. Look for it on the label if you have a scalp condition like seborrhoea or psoriasis. The medication works by interfering with the progression of the fungus, prohibiting the spread. The Ketoconazole destroys the fungus. The medication is an ingredient in certain shampoos formulated for hair growth because seborrhoea and psoriasis interfere with healthy hair follicles producing thin hair dry hair. These scalp conditions not only prevent hair growth but they are uncomfortable as well. Regular treatment to clear up the condition using medicated shampoo will give you a healthy scalp so your hair can grow thick and healthy. Clearing up scalp fungus can take some time so it is important to use the medicated shampoo frequently and consistently to get rid of the fungus. After that, you may want to continue using the shampoo exclusively or alternate with other hair growth shampoos. Some hair loss and thinning is normal. About 150 hairs a day are lost then replaced through our normal hair growth cycle. As we age, we may find that new growth hair is thinner hair, signaling a change in the health of the hair follicle itself. Certain scalp conditions like psoriasis and others may interfere with healthy hair growth. Genetics play a role in hair loss for women as well as men. For women, it presents later in life, usually after age fifty. Proper treatment can lessen the effects of aging and genetics. We all experience times of extreme stress because of emotional or physical trauma. Life events such as pregnancy, surgeries, death in the family, financial and relational difficulties all stress our bodies, including our hair. You might not notice it while in crisis but it is likely hair loss has accelerated. Medical treatments, such as chemotherapy, often lead to temporary hair loss. Once treatment is completed, we are grateful for the cure but we women want our hair back as quickly as possible. Proper hair and scalp care will help. We women have more confidence in every area of our daily life when we are satisfied with our appearance. Hair is a major player in how we view ourselves. If our hair looks good, we feel better. That is why we spend so much time and money on hair care products and grooming tools. A good hair day by itself will not solve any problems but when we look our best, we can relax and tackle whatever the day brings. It is like putting on an armor before battle, every day. Given short reviews of each of the 5 top shampoos for hair growth of 2015 that can help you determine what shampoo is best for you. The reviews on this product indicate customers love it. They like the way it makes their hair and scalp feel due to the tea tree scent, and best of all, it works to prevent further hair loss and heals damaged hair follicles. The hair growth shampoo is organic with no harsh chemicals or artificial ingredients that can dry your scalp, leading to hair loss. If you are allergic to sulfates, you are safe with Pura d’or Hair Loss Prevention Premium Organic Shampoo. It contains no sulfates. Both men and women report excellent results with this product. Since the shampoo contains all natural ingredients, it is safe for daily use. A small number of people experience dry unmanageable hair after using the shampoo. Most users report their hair stops falling out at an unusual rate and are grateful the product performs as promises. Others experience the benefits of new hair growth as well. It starts growing slowly as light baby hair but the double benefits are gratifying. The company does not use animals for product testing. Main ‘n Tail Herbal Gro Shampoo & Conditioner has an excellent reputation for promoting clean and healthy hair. Consumers who use it loved the way their hair looked and felt. As far as promoting growth, some people thought their hair was growing faster and felt thicker. It seems people do not use this shampoo primarily to stop hair loss or prevent it. Used in combination, the shampoo and conditioner prevents drying and breaking of hair so they see less hair loss. It does not contain the primary ingredients you would look for in a growth shampoo such as DHT blockers. It does contain chemicals and sulfates. Its use of “herbal” and “olive oil” is likely the reason for the excellent conditioning of scalp and hair. Hair Surge is caffeine infused to stimulate hair follicle health and buyers of the product seem pleased with its performance. Their hair feels thicker and grows more quickly. Many experienced new growth. Most are pleased with the citrus scent and the condition of their hair after shampooing. Those who bought the shampoo hoping to lessen hair loss were not disappointed. This shampoo contains Saw Palmetto as a DHT blocker. It also contains 0.2% of ketoconazole, an antifungal medication meant to speed up growth by creating a healthy scalp. This product does contain chemicals and sulphates. Overall, consumers were satisfied with the results they experienced. Mostly positive feedback for this product because of the scalp treatment properties. Those buyers experiencing hair loss caused by scaly scalp disorders benefited from the healing properties of ketoconazole. Once the scalp is healthy, there is more healthy hair growth and less daily hair loss. The product does not advertise false claims such as growing new hair on baldheads. Many felt it made good on the promise to condition the scalp to prevent hair loss and promote faster hair growth. The shampoo was developed to make hair appear and feel fuller and thicker. Some purchasers did not experience those results after using the shampoo and were disappointed. Regenepure ‘dr Hair Loss Shampoo is applied and left to work for ten minutes or more. The effective ingredients are ketoconazole, saw palmetto extract, vitamin B6 and zinc, niacin, caffeine and natural oils.There are no harmful chemicals and no sulfates in the shampoo. Therefore, it is safe to use daily. This highly rated product promises to improve the hair appearance by making the hair look thicker. The active ingredients are caffeine for growth stimulation and DHT blockers. The red clover in the formula is an anti-inflammatory for skin health. Sage leaf extract and Aloe Vera are both skin conditioning agents. The shampoo does not contain Sodium Laureth Sulfate (SLS) or Paraben. After using the shampoo, some consumers experience dry frizzy hair and others say it left hair slimy. Most users like the way the shampoo smells and the condition of their hair after use. The product, developed and tested in the U.S., is not animal tested. For some, those facts alone is cause to choose this product. Directions for use include applying the shampoo to the scalp and waiting three to five minutes before rinsing. Since the shampoo contains no harsh chemicals, it is safe for daily use. What is The Best Shampoo for Hair Growth? The ingredients in the shampoo are all organic. 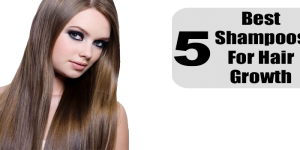 There are no sulfates, harsh chemicals or artificial ingredients. Therefore, it is safer for daily use even for those with sensitive skin. More users commented they experienced new hair growth with this product. The company has no need to test their products on animals to insure the safety of consumers. Whichever product you choose, be patient. Consistent treatment over several months may be necessary before results are obvious. If you use these products for a week or two expecting miraculous results, you will be disappointed. That is not how it works. It takes time for the healing and regeneration to take place so your normal cycles of hair loss and replacement can reset. If possible, consider cutting back or eliminating the use of heat and chemical dyes that cause hair to dry and break. If you must use them, all the more reason to choose excellent hair growth products as a lifelong routine. Keep in mind too that your overall health habits influence the health of your scalp and hair follicles as well as the rest of your body. Making good nutrition choices will help insure against hair loss because of poor diet. Stress management, including exercise, is helpful in preventing hair loss. The best shampoo for hair growth combined with good health habits and a little patience will help you regain and keep a good-looking head of hair. No extraordinary effort is needed, just an extraordinary product.